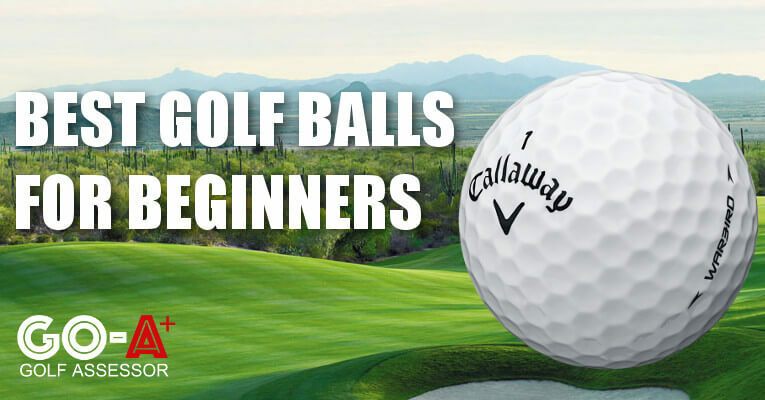 Best Golf Balls for Beginners - Start With The RIGHT Ball! Home » Equipment Reviews » Balls and Accessories » Balls » Best Golf Balls for Beginners – Start With The Right Ball! Best Golf Balls for Beginners – Start With The Right Ball! Just starting out in golf and looking for the best ball to begin with? We recommend the Pinnacle Soft Golf Balls as the best golf ball for a beginner or high handicapper. The Pinnacle Soft provides just the right balance of softness for feel and design for length, all at a great price! If you have a slightly higher budget then you can’t go wrong with the Nike PD Long golf balls or the Titleist Velocity balls. The Pinnacle Soft is our choice for the best golf ball for a beginner. The enhanced 332 dimple design offers a consistent and optimal ball flight. The core is the ‘engine’ of a golf ball and Pinnacle have a powerful one at that! The Pinnacle Soft has been engineered with a high energy, low compression core that provides soft feel along with maximum distance. Superb choice for a beginner and at a great price. Good value for money and will definitely get a couple of rounds out of this ball provided you don’t lose it! The Nike PD Long balls come with a 314 Dimple pattern which allows for a penetrating ball flight and added roll. A high velocity core and softened cover allow for increased responsiveness and obviously more distance off the tee. 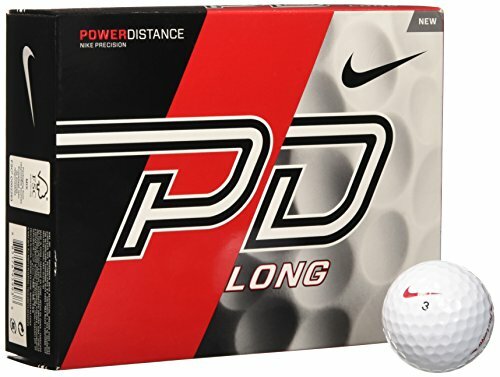 These features, along with the really affordable price, make the Nike PD Long a great value golf ball for a beginner. Plenty of roll upon landing, balls just goes forever! Titleist are without doubt the leader in the golf ball industry. 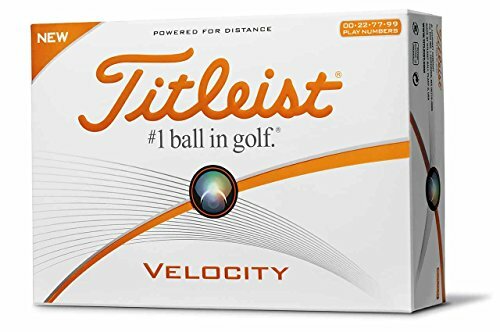 With the Velocity, Titleist have offered a great ball at a reasonable price for a beginner or higher handicapper. If you are wanting distance as well as a mid range softness then this is a great option. Low spin and plenty of distance off the longer clubs due to the larger LSX core and a nice soft feel around the greens. 328 dimples provides a penetrating trajectory and shallow angle of descent. Although this is the softest golf ball Callaway has ever made it doesn’t mean this ball doesn’t go the distance! 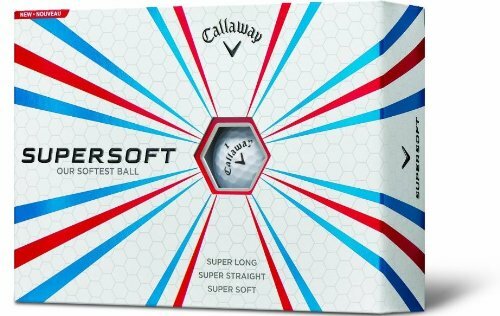 Most of us are wanting a soft feeling golf ball without losing distance and Callaway have provided just that. The low spin off the clubface keeps it flying straighter and further to help you shoot low scores. Not to mention the durability and just how many rounds you can get out of one ball (if not losing the ball in the water etc). One would think that because of the soft cover it won’t last long, but that is definitely not the case here. Available in four different colors: white, yellow, multicolored or pink. 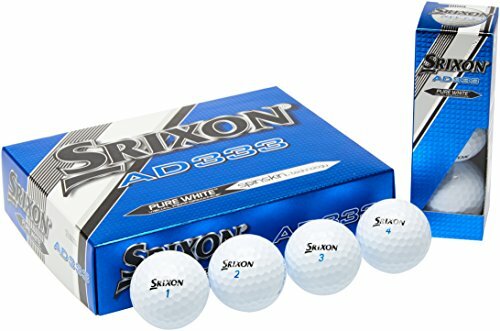 The Srixon AD333’s are one of the most popular golf balls for novices as well as seasoned high handicappers. The Energetic Gradient Growth Core has been designed with four primary factors in mind aimed at the beginner to intermediate golfer. These are Spin, Trajectory, Acceleration and Responsiveness. The 324 dimple pattern and technologically advanced Spin Skin provide beautiful feel and a truer ball flight resulting in maximum distance off the tee. The Spin Skin coating creates slightly more friction at impact which aids feel and control around the greens. If you’re looking for distance then this is the golf ball for you. The Callaway Warbird has the renowned HEX aerodynamics reducing drag and promoting a higher launch to maximize carry. Regardless of swing speed the larger than standard core is highly compressible allowing for maximum ball speeds and distance. The ionomer cover works hand in hand with the core to provide a really satisfying feel off every club. 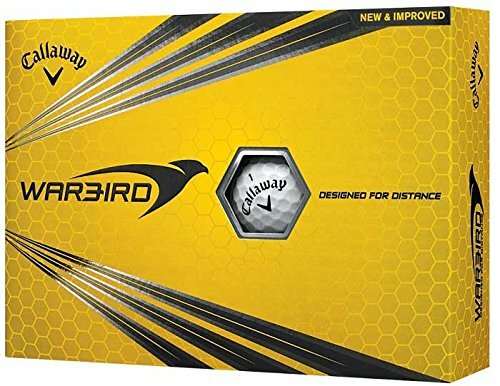 Available in either white or yellow, the Callaway Warbird golf balls are superb value for money if you’re just starting the game. One interesting thing to note though (although nothing to worry about), Callaway don’t make mention on their website of how many dimples each of their golf balls have. It’s strange and having read what you have below in this review you will likely be more interested in knowing how many dimples a golf ball has before purchasing. Not incredibly soft in terms of feel, but adequate enough especially being a distance ball. 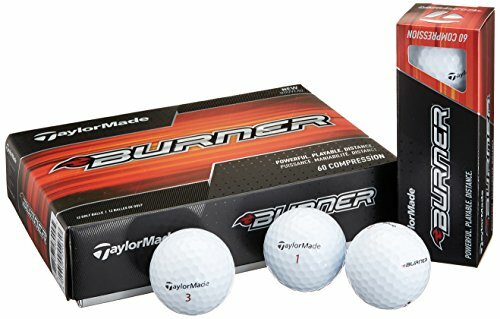 Taylormade Burner balls are two piece 342 dimple golf balls that have been designed keeping all playing aspects in mind – distance, durability and feel. Being a 60 compression ball, the Burner really has a lovely soft feel about it yet still provides plenty of distance off the tee. There have been a number of people who even go so far as to say it feels like a Titleist ProV1, but for a whole lot less money. One big plus is how well it performs in windy conditions. When playing into the wind, it’s as if the ball penetrates far better than other distance balls and hardly any yards are lost at all into a breeze. Fantastic value for money at the price and does a whole lot more than just add distance. Hats off to Taylormade on this front. Versatile offering ticking the boxes of feel, distance and durability. Performs exceptionally well in windy conditions holding its line through head on or side winds. We hope this buying guide makes a difference to your game, and if you like it we would be delighted if you left a comment below or shared with your mates! You may also want to check out our advice and reviews on the Best Golf Clubs for Beginners and the Best Drivers for Beginners. Take Global Golf’s survey to find the right ball for your game. There are anywhere between 300 to 500 dimples on a golf ball, but the most common number of dimples is somewhere in the region of 336 to 392. Dimples create a super thin turbulent boundary layer around the perimeter of the ball in order to smooth out the flowing air downward around the golf ball and subsequently pushing the golf ball upward. Much like the aerodynamics of an airplane and how it glides through air. Dimples on a golf ball are absolutely imperative to performance. Without doubt this is the most important factor in a golf ball as dimples are what makes the golf ball fly the distance it does. In a nutshell the less surface area on a golf ball the less it is affected by wind and rain slowing it down when flying through the air. The deeper and smaller the dimples, the lower the ball flight and higher the backspin. Conversely the wider and shallower the dimples the higher the launch and lower the spin rate. The latter obviously you’ll agree provides a lot more distance as opposed to the first option. Dimples come in all different shapes such as ovals, teardrops, hexagons and the most common of these being circles. One thing must be said though – non-circular dimples have been short lived in bouts. Manufacturers have tried these shapes and soon realized that there was no benefit whatsoever and was not particularly successful. The shallower and fewer dimples a ball has – the better! Being a beginner you’re going get more distance! Generally there are two primary cover materials to the modern golf ball. First is a surlyn cover and the second is a polyurethane composition. Of the two the surlyn provides a slightly firmer feel and the primary effect is distance. The polyurethane covers are softer and provide more spin and control. When choosing the right golf ball keep in mind what exactly you are after. Is it primarily distance and durability being a starter golfer that’s just taken up the game or are you wanting more of a soft feeling golf ball? In our opinion the goal for you being a beginner would be to find the longest golf ball available, but also one with good feel. It really isn’t pleasant playing golf with a rock hard ball so try find middle ground between feel and distance when seeking your ideal golf ball. It may even take a round or two to test three or four balls and see which suits you best. One thing is for certain though – we’ve picked out the best options there are on the market so stick with one of the options above! It’ll save you a bit of time that’s a guarantee. Generally the Urethane golf balls are more for advanced or Tour level golfers, but you do still have manufacturers offering mid-level golf balls with this cover composition. Once again, of the two major types of cover compositions available you will be opting for surlyn covered golf balls, which will benefit you distance wise. Typically one piece golf balls are found at your golf driving range. They are the cheapest balls you are going to find. Very unlikely you’re going to find these balls for sale to actually use on the golf course. One piece balls are generally made of a solid surlyn piece with dimples moulded into the cover. A hardish ball with a acrylate or resin core generally covered in surlyn. The cover is exceptionally durable and doesn’t cut or chew badly thus providing you with something that lasts a good couple of rounds (if you don’t lose your balls that is!). Two piece balls are very affordable and provide plenty of distance so they are very popular amongst beginner golfers – that is you! They don’t spin much, though! Today’s three piece balls have a solid core with an enhanced layer of rubber between the core and the cover. The cover is moulded over the golf ball and is made up of either a surlyn or polyurethane material. Three piece balls are softer than two piece balls and offer higher spin rate, which allows for better control in terms of ball flight along with slightly more spin on the green. What is handy about three piece balls is that they provide one with a lower spin rate with a driver compared to a wedge. Three piece balls are still a good option for a beginner if you prefer a softer feeling golf ball. The better players’ golf ball. Made up of either four or 5 layers and providing players with higher swing speeds more distance and maximum spin possible. Inner core provides explosive distance and the layers in between core and cover provide varying spin rates depending on what club is being used. Lastly the cover is ultra thin allowing for maximum backspin and control on wedge shots. Only downside is the golf ball chews quickly and you’ll likely be going through two at least each and every round you play. The best players in the world aren’t looking for distance out of a golf ball, but rather spin and control and the multilayer golf ball provides just that. Compression is a measure of the deflection a golf ball undergoes when it is struck. It is measured between 0 and 200, with 200 being a ball that does not compress and a 0 being a ball that deflects 5mm or more. Most golf balls range between 50 and 100 in compression. The lower the compression of a golf ball, the more the ball will deform upon impact. And a knock-on effect is the bigger the area will be that comes into contact with the clubface. Lower compression golf balls are softer and more suited to the slower swing speeds or beginners whereas higher compression golf balls require higher swing speeds in order to gain maximum control. Because you are a beginner and unsure which compression suits you best, please keep in mind one important fact. A low compression golf ball isn’t only for low swing speed players. If you have a high swing speed and prefer a softer feeling ball then go for it. If you have a slow swing speed don’t even waste your time with a high compression golf ball! We hope our best golf balls for beginners review has helped you make an informed choice on the right ball for your game, but if your still have questions just leave a comment below and we will respond within 24 hours! Paul hit his first golf shot at the age of 5, and from that point on was immediately hooked. He went on to become one of the leading amateurs in South Africa, securing a full golf scholarship with the University of Arkansas Razorbacks. Turning professional in 2004, Paul played extensively on the Sunshine Tour and co-sanctioned European Tour events. Paul is our lead editor at Golf Assessor. Been using Wilson duo/dx2 for a while but recently gave pinnacle gold a go with good results. Swing speed is fairly slow, around 70mph with the driver playing off 24. 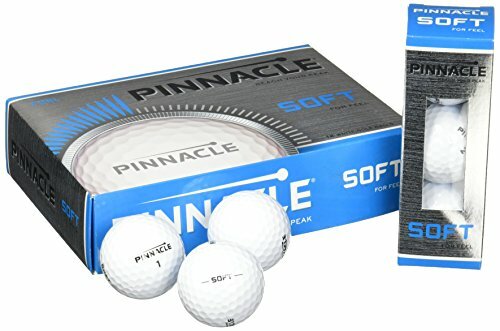 Wondering if the Pinnacle soft would be worth a go, or something else. Cheers. Thanks for getting in touch James, the Pinnacle Soft are fantastic. You’ll be getting plenty of bang for your buck in terms of both feel and distance – and at a great price. Keep on golfing! Srixon soft feel for me all day long. Great spin control in and around the green and affordable and they last a few rounds without carving up. Not bad for a $15 box of balls. I am always looking to learn about golf balls. All I can ever read about is how soft the ball is and the affect it has on the distance. I generally hit the ball further than most I play with however I typically loose a ball or two on eighteen holes. Any suggestion on a ball that may be more suitable for me? Hi James, if you don’t struggle for distance then I suggest you go for a mid compression ball like the Titleist NXT Tour or the Callaway SuperSoft. Golf Assessor provides independent golf equipment reviews and side by side comparisons so that you can make the most informed decision on your next purchase. Our aim is to help you play better golf! If you are just starting out in golf, check out our sister site, Golf Guide for Beginners. Thinking about buying equipment we’ve reviewed? Golf Assessor is a participant in the Amazon Services LLC Associates Program and Amazon EU Associates Programme, an affiliate advertising program designed to provide a means for sites to earn advertising fees by advertising and linking to Amazon websites in the US, UK, Canada, Germany, France, Italy and Spain. © 2016-19 Golf Assessor. All rights reserved.